Earlier this summer we released the first ebook in our eLearning Program Success series, “5 eLearning Myths and How to Avoid Them.” This ebook is designed to help those interested in pursuing elearning programs for their companies to dispel common assumptions, such as elearning being expensive and time-consuming, and provide information to make the argument in favor of implementing elearning. Our second ebook in the series, “Game Plan: 10 Steps to a Winning eLearning Program,” expands on the information provided in “5 eLearning Myths” and outlines a step-by-step plan to begin building an elearning program. The ebook takes you through the beginning stages of building an elearning program, including how to build competency maps to better match courses to your desired skill sets. “Game Plan” then moves into what to look for in elearning courses and the various payment models available in the market. Finally, methods of measuring the effectiveness of your program to ensure you are getting the most out of your elearning courses are covered. Together, these ebooks help you develop the perfect elearning plan for your company and employees. Let us know how your program is going– we’d love to hear your story! 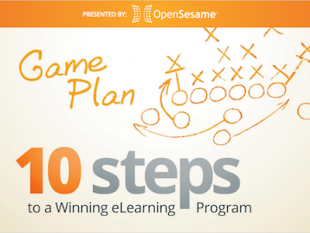 Download your free copy of “Game Plan: 10 Steps to a Winning eLearning Program” and get started implementing your program today.